Banteay Srei is often known as the "Temple of the Female Warrior" and "Temple of the gods of construction". The temple is a delicate miniature model of Angkor Wat in the midst of a vast and mysterious fairy forest. It is located near Phnom Dei Hill, 25 km to the northeast of the ancient capitals of Yasodharapura and Angkor Thom. 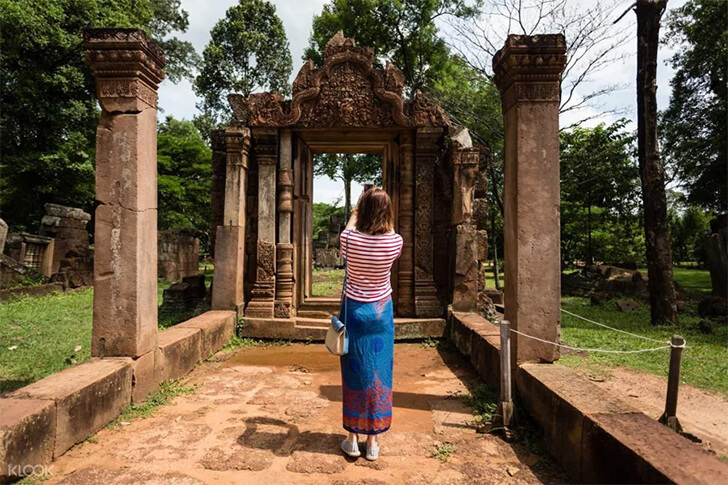 In this article, we will show everything you need to know about Banteay Srei before you start the journey of discovering this temple. According to the local people, Banteay Srei Temple has the four most special things: the farthest temple from Siem Reap (35km), the temple which uses the most red sandstone material, the temple which has the most sophisticated architecture among all the temples in Cambodia, the temple which has the smallest scale when imitating Angkor Wat. Banteay Srei was built under the reign of King Jayavarman 5. The temple firstly was named "Tribhuvanamahesvara", worshiping the Hindu god - Shiva, surrounded by many small shrines called Isvarapura, later renamed "Banteay Srei". The temple was originally built in the 8th century but with rudimentary carvings. Until the 12th century, the motifs were sculpted meticulously again. The sculpture on red sandstone had lasted until the 14th century. It is the unique artwork of its kind. Up to now, researchers have not yet proved why they sculpted on the extremely hard rock like that. This temple had been forgotten for decades with the Angkor Wat complex, and by 1914 it was discovered by French archaeologists. In 1923, a couple of 22-year-old French writers and their friend chiseled several statues to Phnom Penh to sell to someone they had negotiated before. Unfortunately, they were arrested there. The total weight of statues they stole was 600 kg and they were sentenced to 3 years in prison but did not know why the sentence was not enforced. Since then the Cambodian authorities have protected and preserved the precious architecture in Angkor. Today, Banteay Srei Temple is a popular tourist destination in Cambodia, attracting many international visitors to discover the most sophisticated and unique architecture of sculptural art. Every year, it welcomes more than 1 million of domestic and international visitors. If you have the opportunity to travel to Cambodia, take the time to explore this temple! Before starting your trip, spend some minutes to find out everything you need to know about Banteay Srei as following. At present, the temple lost many relics and sculptures due to the war from 1975 to 1979 when the Khmer Rouge attacked Cambodia. The war destroyed the temple and the antique objects were stolen for sale by bad guys. At present, the temple is almost still intact thanks to the plan of restoration of the temple to serve the domestic and international tourists. 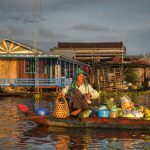 The temple is surrounded by a ditch that is hundreds of kilometers long in the middle of a dense jungle and straight into the Mekong River. 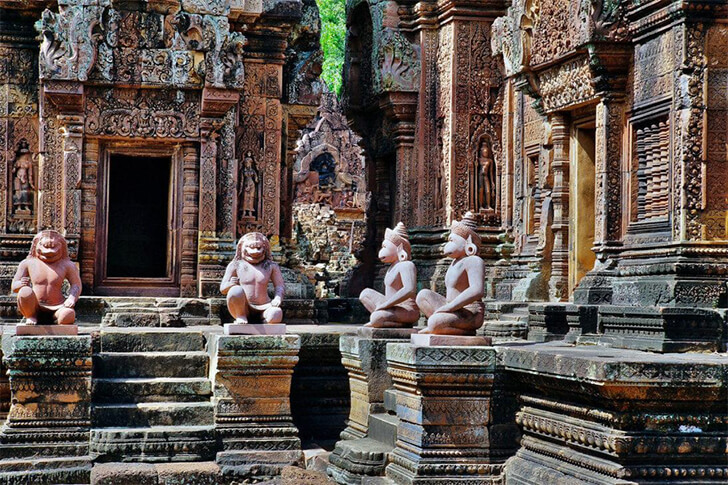 Banteay Srei is referred to as a precious jewel of Angkor art. 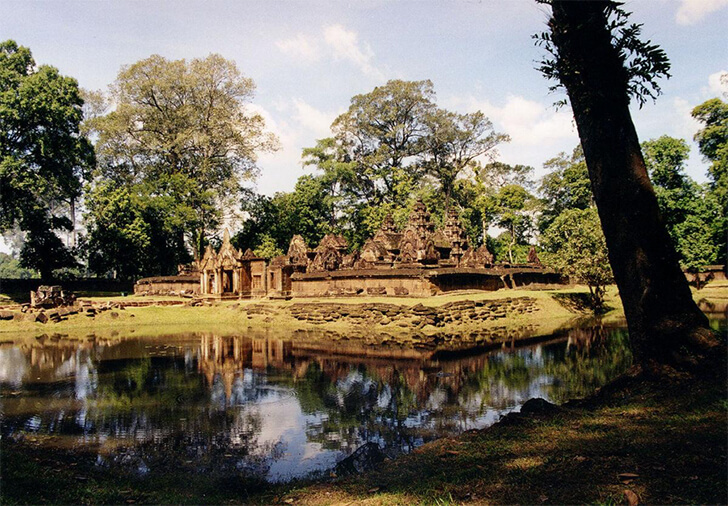 To reach to the Banteay Srei Temple, visitors will go through the hills and see the shrine in an oasis. Now, the road to Banteay Srei is very good, greatly improved compared to that in a few years ago. On the two sides of the road are rows of trees which are planted and refurbished. 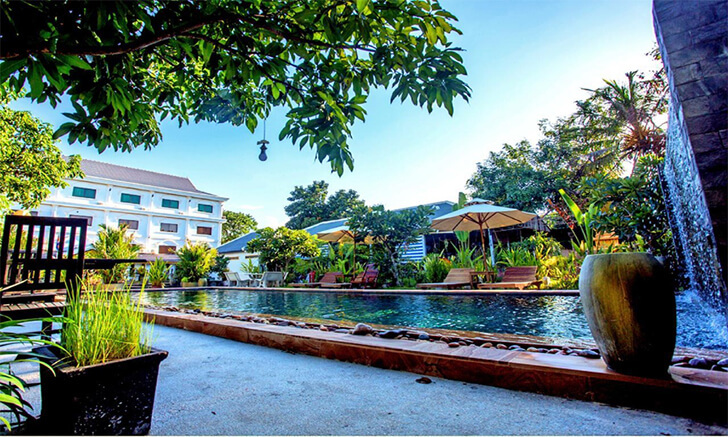 Residential houses in the temple area were previously purchased by the Siem Reap government to expand the relics. The architecture of Banteay Srei Temple is very special with the bold architectural art of Indian Balamon including 3 layers: from the stone bridge to the temple entrance is the first layer, from the second stone bridge through the water ditch to the gate is the second one and the last one is the center including the temple and two buildings called the libraries. The temple is surrounded by the Isvarapura tower system. The temple guardian statues are arranged along the road connecting the outside to the center of the temple. The statues are the copies of ancient statues that are stored and preserved at the National Museum of the capital. On the edge of the door in the hallway lobby is the meticulous sculpture on the rock about the culture such as the image of the Buddhist monks, lions, and gods which are carved elaborately and sophisticatedly to the smallest details. On the small courtyard of the inner construction are three temples worshiping for the Shiva God in the center and Vishnu God in the north. 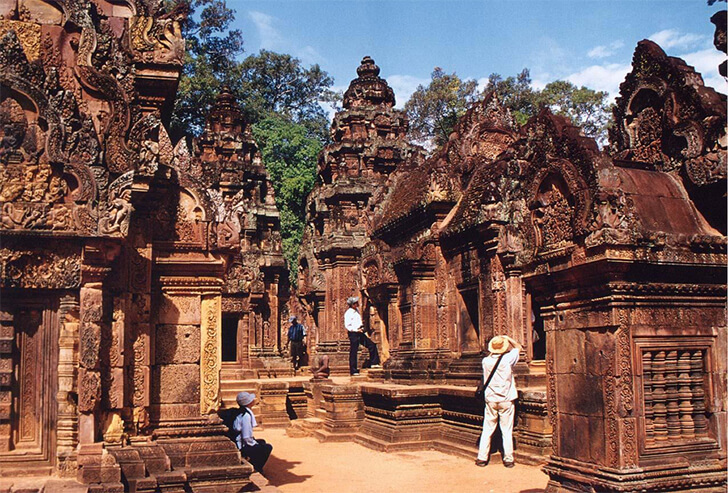 Banteay Srey is a masterpiece of sculpture on the laterite and red sandstone. The colorants are used in the decorative sculptures on the walls. The temple itself is the pinnacle of rock art with the elaborate reliefs. Each wall, each sculpture in Banteay Srey contributes to a unique story. In addition to sculptures such as the snake god of Naga, Kala's face (symbolizing for the immortality), the wind god of Rehu, the fire god of Agni, the myths and epic are associated with the history. The Krisna in the epic of Mahabharata is the reincarnation of Vishnu God into a young man who came to Earth to do two things. The first one was to kill Kamsak - the ungrateful prince who killed his parents and brothers as well as arrested the captives in the palace to become the king. The Lord of Krisna cut off Kamsak's head to free the royal family. Secondly, Krisna God had to kill the demon who received the immortal blessing of Indra God. Because of its immortality, the demon was very haughty and destroyed the humanity. Even if it was distributed in pieces, the demon could still reproduce. To kill the demon, Krisna tore the demon into two parts, and took one piece of the body to another place, so the demon died. In front of the shrine in Banteay Srey, the image of the god Nandi has been half-smashed by the bad guys. On the temple's entrance is the statue of Shiva with Ravanda dance which was carved very elegantly and delicately. Associated with these statues is the story of rescuing humanity from the destruction of the fire god of Agni. The fire burned the world, making people and animals chaotic. The humanity was suffered but no one could extinguish the fire. Finally, the gods invoked Indra God to extinguish the sacred fire. Indra God, after knowing the suffering of humans and animals, used elephants to spray scared water to extinguish the fire. The stories, patterns, details, and themes in the temple are shown by the extremely skilled carvings on the rock. It is said that the sculpture of Banteay Srey is closer to the technique of engraving on gold and wood than that on stone. It is the talent of artisans that creates a magical attraction for Banteay Srey Temple Complex, which makes all the visitors who have admired the most remarkable sculpture of all time of the Angkor Empire in Cambodia once really impressed. This is an important part of the list of everything you need to know about Banteay Srei. 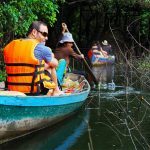 It will be very helpful for your trip to Banteay Srei as well as other temples among the Angkor Complex. Let’s check it out! If you want to visit the temple here, it is a good idea to rent a bicycle (if you know the way) or a tuk-tuk driver who will take you to any destination you want. Not only that, the tuk-tuk drivers will be the great guides to help you learn more about the history of the temple. You should plan your itinerary to this temple in advance whether you hire a tuk-tuk driver or rent a bicycle for a day. It will help you save much time and energy. You can find a tuk-tuk in anywhere, and the drivers are always ready to take you to any place on your schedule. Waking up early and visiting the temple as soon as possible is the way to experience the full beauty of Banteay Srey Temple. Going from the early morning, not only gives you the opportunity to watch the sunrise but also helps you avoid crowds before the sun wakes up and makes everything "chaotic." As a spiritual place of worship, you should pay attention to your outfit. Only a scarf or a sarong is not enough in Cambodia. Thus, the discreet and polite attire is the best way to avoid problems that may be encountered when visiting the temple. Avoid sleeveless shirts, shorts or over-knee skirts.